Which is the best choice for your organization- Shared or Dedicated web hosting? A shared hosting means other sites are being hosted on the same server, while a dedicated hosting means that only your site is hosted on the server. With shared hosting the bandwidth and amount of disk space offered is limited. This is obvious because there are other sites sharing the space. While the dedicated web hosting has no such limits. In case of shared hosting once the user surpasses the allotted bandwidth or disk space, they are charged for extra usage. Shared web hosting is cheaper due to resource sharing but offers less freedom while dedicated web hosting offers enough features. If your company is growing rapidly, dedicated web hosting is a better choice. The basic mechanism of shared web hosting makes it less secure than dedicated web hosting. It is simply because your website will be on a server shared by multiple websites. There can be different types of websites on the server and malicious codes can cause the entire server to crash. On the other hand, dedicated web hosting promises a reliable and more secure hosting. Important firewalls are in place to keep the server up and running. A dedicated server offers more control as the user can add their preferred scripts and almost every type of software. 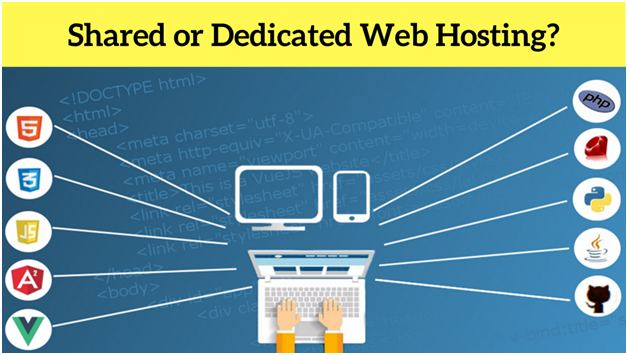 Dedicated web hosting would require a technical aware manager to handle the server. On the other hand, if you do not a dedicated server manager it is advised to use the shared web hosting service. There are restrictions on type of scripts to be used but this is an economical option if you do not know how to manage and control everything. Clearly on the shared web hosting platform resources are divided. Hence the response time and loading time are slow. This does not happen on a dedicated server. Clearly if your business is expanding and has heavy traffic and dedicated server is a better ROI choice. In case of a functional and informative website, where the company does not need a technical person to handle the server, a shared web hosting is a better choice. Data Loss Prevention, Web Hosting. permalink. Received a new job offer? Beware- Genuine or Fake?